ASCS alumni (2014) and now a Cardinal Newman High School Senior was featured for her community work. Morgan Sousa (pictured far left) has been working very diligently over the last 5 months on the Bluewater Babes Fish For A Cure Fishing Tournament, a charity that raises funds to support women with breast and ovarian cancer. Morgan was selected as the committee head of the teen division which raises funds for children of women affected by cancer. Morgan's committee raised over $22,000 which will help pay for summer camps, school supplies, and tuition. "I joined the Bluewater Teen Babes team because cancer has truly changed and touched my life. I want women who are fighting breast and ovarian cancer to know that their families and children will be cared for during their time of need. Through this organization, they will always have guardian angels watching out for them." Michael DiFederico, 16, of Stuart completed his Eagle Project this summer. Working with missionary Djumy Septembre at carha.net of Port St. Lucie, he collected 500 pairs of new and slightly used sneakers to be sent to the CARHA Mission in Haiti. This project will directly aid young children, Pre-K through High School, so they may attend classes this fall with the proper shoe attire. A junior at John Carroll High in Ft. Pierce, Michael enlisted the help of his classmates as well as teachers who embraced the project. In addition the young men of his Troop 840 helped by passing out flyers throughout the neighborhoods imploring people to donate. He was in contact with former classmates of All Saints School in Jupiter who accumulated more sneakers as well as donations. Above all that Michael collected sneakers at his parish of St. Christopher in Hobe Sound. Family and friends were also recruited to chip in. Finally, he was asked to make a presentation to The Knights of Columbus, where he ultimately received much needed support. In collecting the slightly worn sneakers, after inspection, some needed washing and others required shoe laces to be replaced. DiFederico laundered the sneakers and labeled them according to size and gender. He used the donations to pay for the shipping and to buy new sneakers. He also threw in a few soccer balls for fun. They were then shipped to Haiti and were given out to the children, just in time for school to begin. UPDATE: On September 20, 2017, Michael passed his Eagle Scout Board of Review. Congratulations to Class of 2013 alumni Shane Drohan (pictured second from right)! Shane has signed with Florida State University to play baseball. Read more here: http://www.cardinalnewman.com/apps/news/show_news.jsp?REC_ID=428766&id=0. 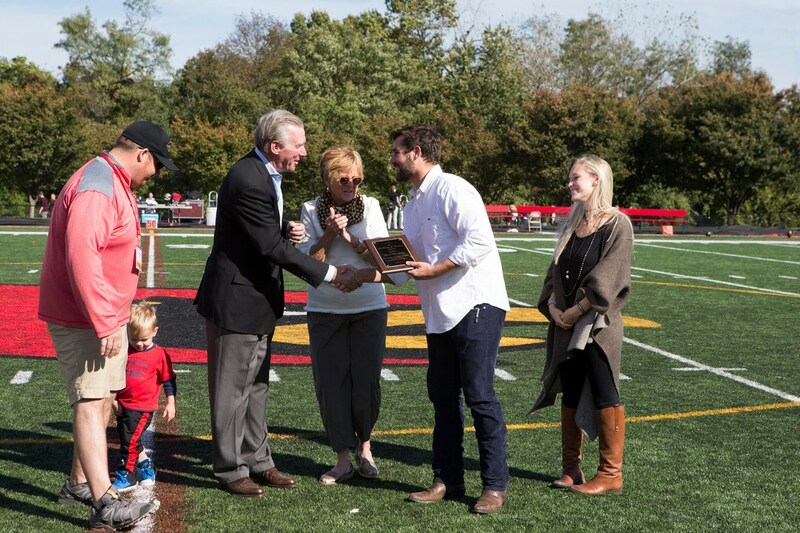 The Catholic University Anthony J. Bottoni Leadership Award was established in 2000 to honor the football team's outstanding senior leader. The award is named in honor of Anthony J. Bottoni, a two-year starting right guard for the Cardinals who was passed tragically in December of 1999. Just a month prior, Bottoni helped Catholic win its first league football championship with a 6-0 record in the Old Dominion Athletic Conference. Ross Sanford, a 2009 ASCS alumni, is a two-time All-Old Dominion Athletic Conference Linebacker who served as a team captain last season. A four-year contributor to the program, he led the team in tackles and was third in the conference as a junior while adding three sacks, nine tackles for loss and two interceptions. Last year he matched his sack totaled, forced two fumbles and recorded seven and a half tackles for loss. He finished his Catholic career with 239 tackles, 19 tackles for loss and five forced turnovers. Additionally, he is a two-time member of the ODAC All-Academic Team. In retrospect, Connor Walsh might view All Saints Catholic School as a stepping stone that led to many greater achievements after his graduation in 2007. The virtues of honor, duty, respect, discipline, selflessness, and integrity that are part of our Catholic faith were further solidified in him as a cadet at The Citadel where his strength and character were further developed and challenged. 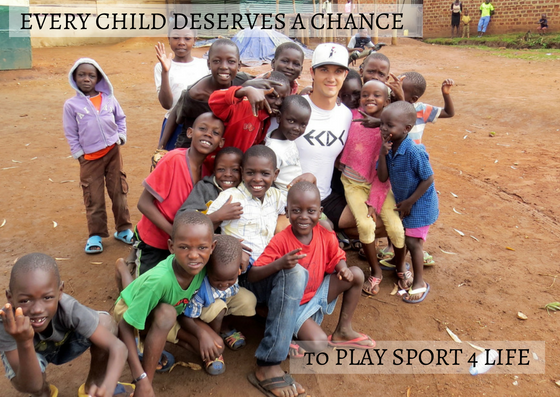 Walsh, a 2015 Citadel graduate with a Bachelor’s Degree in Political Science and emphasis on military and international affairs, has since teamed up with Play Sport4Life (PS4L), a nonprofit based in Cape Town, South Africa. The organization’s mission is to give disadvantaged children opportunities to play sports which is something right in Walsh’s wheelhouse. While at The Citadel, Walsh was a pitcher, first baseman, and outfielder for his Bulldogs baseball team, and received accolades in being selected to the All Southern Conference first team in 2015, as well as being named Louisville Slugger National Player of the Week, to name just a few.